By popular demand, the KOMBUCHA IS BACK!!!! 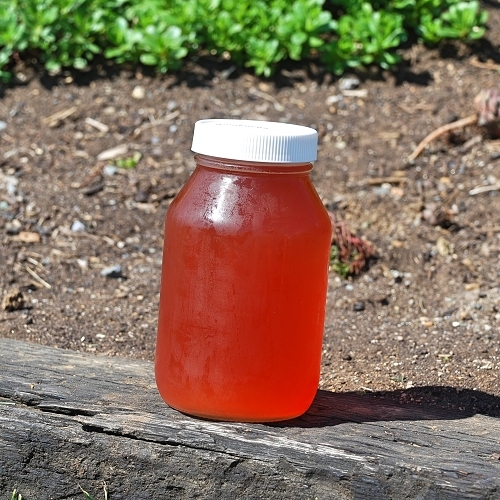 A SCOBY (Symbiotic Colony of Bacteria and Yeast), tea and sugar makes kombucha. After steeping tea in boiling water and allowing it to cool, a SCOBY is added to the room temperature tea and allowed to ferment in a warm room (76-82° Farenheit) for 1-2 weeks. Why sugar? 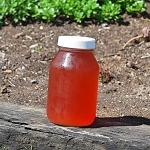 Without sugar, the culture has no food to ferment and simple table sugar is preferred by the SCOBY as the easiest type of sweetener to digest. As a result of the fermentation, almost all of the sugar is converted by the SCOBY and when fermenting is finished, there will be about 2-3 grams per 8 ounce glass. By contrast, an 8 ounce glass of orange juice has about 24g of sugar. Natural carrot juices have 13g per 8 ounces (there is also a HONEY strain Kombucha, but please inquire about that by calling Niki or Mike Moskos). What does SCOBY stand for, what is its purpose? SCOBY stands for: Symbiotic Culture of Bacteria and Yeast. It is a living organism. It looks like a large jelly-pancake and is not too dissimilar structurally from a vinegar mother culture. What are some for the health benefit claims? Analysis of the contents of kombucha confirms that it is rich in amino-acids, probiotics, antioxidants, glucuronic acid, trace minerals, B vitamins and more… It is a living, enzyme-rich drink. Just about every established medical research university claims that all these things are excellent for your digestion, immune system, and in the case of amino–acids, glucuronic acid and antioxidants, potentially cancer preventatives etc. etc. We are not making those health claims— they are.